UK - Leading UK based 19 inch rack specialist designer, manufacturer and supplier Pro Audio Stash (PAS) has launched a new range of custom rack faceplates and shelves with magnets. A simple and ingenious concept unique to PAS, the magnets are fitted to the inside of the vented rack shelves and hold the face plates in place, offering extremely quick and straightforward installation … and removal / access for maintenance. These PAS products are designed and manufactured in the UK to the highest specifications and robust build quality for which the brand is renowned. They have been developed with both installers and end-users in mind, offering the ultimate streamlined and aesthetically pleasing finish to any rack install. The product consists of a 1U, 2U or 3U vented rack shelf and faceplate cut-out that has been custom designed to fit a selection of popular AV devices that are normally not rack mountable. 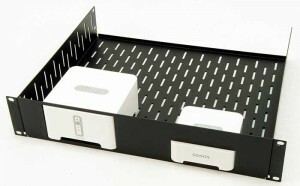 These currently include Sonos wireless audio system devices, Sky and digital TV boxes, amplifiers and games consoles. 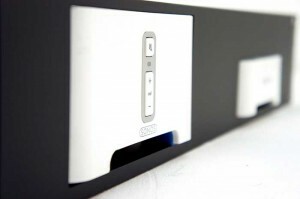 The magnets enable easy access to the device behind the faceplate – without the need to unscrew the entire shelf - should it need to be changed or maintained at a later date. The flat faceplates are ergonomically shaped to the design of the device, further enhancing its profile within the rack. Whilst functional for storing equipment, they also bring slick professional styling to any environment. AV rack installers in all sectors, particularly those working in high end and luxury home environments as well as those servicing office, commercial and industrial sites are meeting increased demands for the racking elements to look cool. PAS has developed this range in response to customer feedback and in particular a demand for neat racking solutions for the Sonos devices, with the Sonos connect amp, Sonos ZP90 and Sonos Bridge among the most popular items. Currently PAS has a standard range of pre-designed faceplates with magnets available for the most commonly used devices, but bespoke faceplates can be fabricated for any device on the market … and the range is expanding every month!